Well, this is strange. 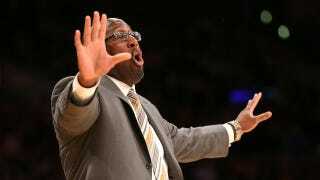 USA Today is reporting that the Los Angeles Lakers have fired Mike Brown. Sure, the Lakers have struggled to begin the season—but it's five games of 82! That's the equivalent of one game in an NFL season. And Brown's task was not easy, either: He had to integrate Steve Nash (who has only played one full game this year), Dwight Howard, and a brand-new Princeton offense, while trying not to get murdered by Kobe Bryant. Teams that have as many superstars and egos as the Lakers do take some time to come together. Remember when the Miami Heat started off with a 9-8 record the first season that LeBron James and Chris Bosh came aboard? That team turned out OK. So who might be replacing Brown? Woj has floated Mike D'Antoni's name. That could be pretty awesome, and it would make us all forget about Mike Brown and not even feel the least bit bad about the fact that he has to spend the rest the season spitting sunflower seeds into a Gatorade cup in his living room.